Water - fluid of life June 8th to 16th 2019.
park with 16 falling lakes and countless waterfalls in the midst of Lika region, Croatian highlands. Lately, water has been studied not only by scientists but also by explorers, artists, philosophers and ecologists. They study the phenomenon of water, they try to explain all the extraordinary qualities that make this fluid specific and unique to this planet and universe. Given those recent discoveries we learn that water has the power to heal as well as destruct, it has a process of self-cleansing, it is a bearer of important biological information and it has memory! By car we left from Bassano del Grappa to Hall in Tirol, a beautiful town nearby Innsbruck (Austria) to see Helene Kirchmair's solo-exhibition "Object trouvé". Marco Maria Polloniato proposed to me going for it's very last day on Saturday, January 12th. So many kilometers to go and see an exhibition that closed the same day, with all the risks associated with any travel mishaps through the snowy Alps, was almost a challenge, but knowing the good insights of Marco and his excellent taste, I came with him without hesitating! Ceramic artist Marco Bolzenhagen also joined our trip. When we arrived in the late afternoon,Helene Kirchmair welcomed us with open arms, but we had to hurry, the exhibition was almost closing, and there was only little time left to admire her body of work. From 24th January to 14th March 2018 Officine Saffi is pleased to present Bouke de Vries solo show. The practice of London-based Dutch-born artist Bouke de Vries perfectly reflects our time, feeding on the contemporary paradox of beauty: a spasmodic research of uniqueness and perfection wrapped in the aesthetic banalization of consumerism. His artistic vision stems from his own experience as a ceramics conservator. De Vries refutes the underlying western attitude that once something is broken it is only fit to be discarded. Even those who take care of preserving works of art often choose to disguise as much as possible the memory of the suffered trauma. Instead he considers himself closer to the Chinese and Japanese tradition of repairing important objects so that the breakage is celebrated, rather than hidden. "I want to give these objects, which are regarded as valueless, a new story and move their history forwards," he has said. "A broken object can still be as beautiful as a perfect object," he adds, citing the Venus de Milo, armless but still venerated. From November 15th until December 22nd, Officine Saffi will host a solo show dedicated to Ugo La Pietra's ceramics. "Una forza interiore (An inner strenght)" - curated by Flaminio Gualdoni - virility as sculptural energy, that generates shapes and volumes through a series of vessels, sculptures, votive figures and photographs. "MORE CLAY LESS PLASTIC - Change in your hand 2"
ceramicists from all over the world who join the MORE CLAY LESS PLASTIC project. "MORE CLAY LESS PLASTIC - Change in your hand 2" will be presented at events linked with sustainable consumption, craft fairs, cultural events, museums. The tour will start in July 2017 in Maniago, (PN) Italy, in Museo dell'Arte Fabbrille and will travel different locations to be confirmed until May 2018. The aim is to promote and value the use of ceramics in every day life, while arising awareness of life quality and environmental issues, all key points of MORE CLAY LESS PLASTIC philosophy. "MORE CLAY LESS PLASTIC - Change in your hand 2" is open to ceramicists and potters of all nationalities and ages in accordance with MORE CLAY LESS PLASTIC philosophy. Roberto Rigon is being revealed to the public after many decades of work and personal artistic research, most of which is unpublished. The exhibition will take place from the 2nd of June to the 2nd of July at the ancient Guard House of Ezzelini Castle in Bassano del Grappa. It will allow the visitors to get close to a selection of achievements in sculpture and graphics from the 50s until now. Puls Gallery is delighted to present two young talented artists: Russian ceramicist and painter Irina Razumovskaya and Danish glass maker Ida Wieth. Maya "the langauge of beauty"
Ended March 5, 2017 in Verona the Maya art exposition. Organized by Arthemisia Group and Kornice, realized by INAH (National Institute of Anthropology and History), the most important institution of the Ministry of Culture of Mexico and curated by Antonio Aimi and Karina Romero Blanco. An exhibition with over 250 artefacts of great artistic and historical worth. 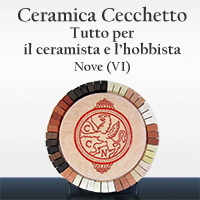 E e decided to publish only the ceramic part, because this is the main interest of our web- portal. For the next exhibition, Puls is delighted to introduce a new body of work by two dynamic women at the vanguard of the British contemporary ceramic art scene. Both artists are London based and MA graduates of London's Royal College of Art. In their relatively short career they have been able to impress many with their originality, skill and above all with a daring new approach to the art form. The meticulously hand built cloud bundles and complex crystal formations created by Tessa Eastman have found a serious following among collectors and gallery owners. Each one of her pieces appears curiously alive with movement. Building her shapes Eastman draws inspiration from organic forms as seen through a microscope. The artist explores the strangeness of growth of natural phenomena in which systems flow and digress from an intended pattern. She subsequently attempts to translate her findings in colourful glazed ceramics. Grouping her works highlights the contrast and creates a dialogue between pieces whereby negative space is valued as much as positive space.